For many years, I’ve been growing my culinary herbs in garden containers. As an amateur cook, I appreciate having fresh herbs readily available. More often than not, it’s usually when I’m in the middle of preparing a recipe that I realize I need a sprig of thyme or a few leaves of basil or parsley. This meant a hurried trip to the “back forty garden” where my veggies and herbs were planted. Planting my culinary herbs in garden containers and placing them on my lower deck, just a few, short feet away from my kitchen door, makes them much more accessible. The container herb garden also adds another degree of beauty and interest, as it set alongside the flowering annuals and fig tree container gardens. About five years ago I started switching my container herb gardens from traditional, hard-sided containers to Smart Pots, which are “soft-sided” containers, made of a geo-textile type fabric available in a wide variety of sizes. I was initially interested in these unique garden containers because of their fabric sides, where I can plant more than just the top. I could plant the walls as well by cutting “X’s” and placing young plants anywhere I wanted. My experiment that first year worked so well that my “Smart Pot Culinary Container Herb Garden” has become my standard way of growing these plants every year since. It has become win-win both for the herbs and myself. I have a conveniently located, beautiful herb garden supply and the plants literally flourish in the Smart Pots. 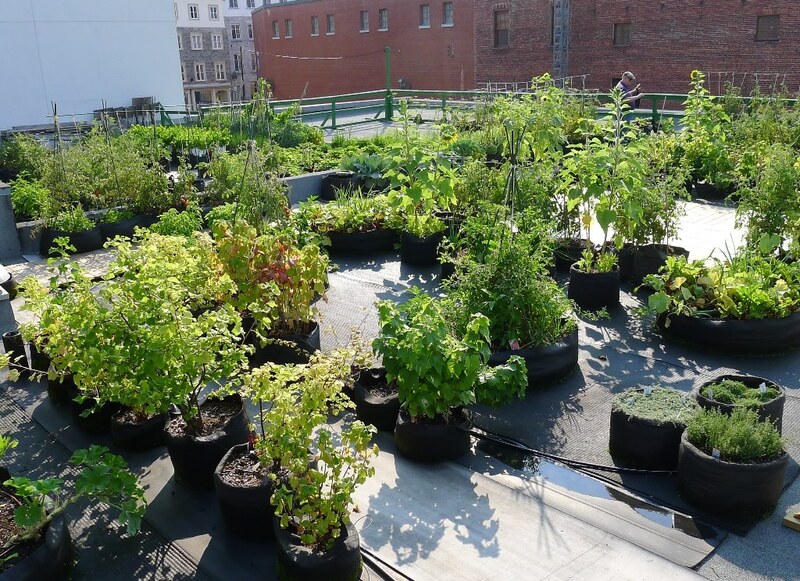 “Smart Pots” have been used by commercial tree growers for more than twenty-years. 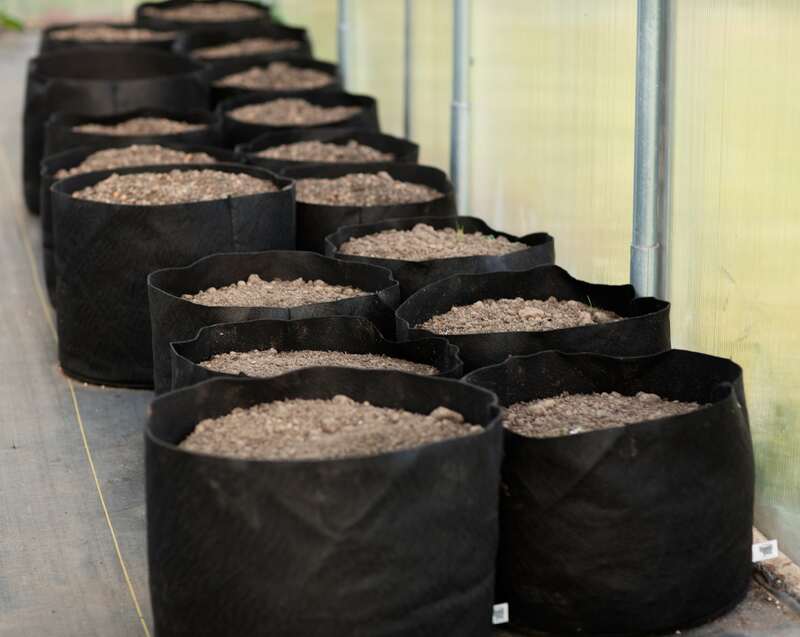 These professional growers prefer using these containers because their trees develop better, more efficient root systems which help produce stronger, healthier, faster growing trees. The Smart Pot’s fabric sides actually “air-root prune” the longer roots causing them to develop masses of lateral ones, rather than the fewer ones found in hard-sided containers. 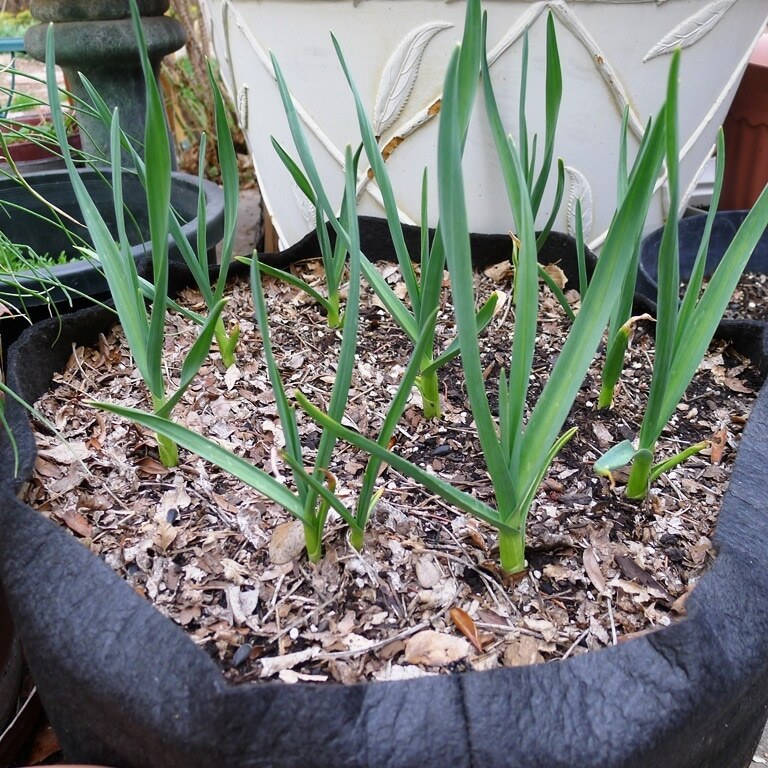 The Smart Pots fabric material also provides excellent drainage and as most gardeners know it is often the lack of adequate drainage that kills herb plants or causes them to do poorly. Smart Pots also offer container gardeners another advantage – they keep the roots much cooler than hard-sided containers during the hot, summer days alleviating heat stress. The herb containers’ porous, fabric material allows the container to “breathe” actually allowing heat to escape by evaporative cooling. I also played around with various garden planting mixes in the Smart Pots. As a horticulturist I was familiar with potting soils and knew that the better ones were developed to provide good drainage. Realizing the Smart Pots’ excellent drainage characteristic I said to myself maybe I could grow my container herb gardens with a heavier, less expensive potting mix, one that actually holds more water. Again, my reasoning was right. I was able to save a few bucks and the herb plants seemed to love practically any growing mix I used. When planting my container herb gardens I fill the Smart Pot with the potting mix and next decide where I want to cut my “X’s” in the walls. I make about 6- 8 “X’s” spaced evenly around the garden container staggering the height of the “X’s” from around one half to three quarters the wall height. In these cavities I plant the prostrate or creeping herbs like thyme and rosemary and even the tiny leaved basil. Curly parsley growing out of the walls is striking. For the container’s top, plant the upright growing herbs like mint, Italian Parsley, sage, etc. You can even try mixing in a few garden annuals like Petunias or Lobelia to add a little color. Just use your imagination. You can’t make a mistake. Marty Gottlieb lives in upstate New York, where he has been gardening and cooking for over 40 years. He earned a horticulture degree from Cornell University way back in the ’60s. Long ago, he was a New York State Coop Ag Extension agent. Marty has been active in the Horticulture and Nursery business his entire career.